SPRINGFIELD, Illinois, August 27, 2012 (ENS) – Illinois cities and towns can still pass ordinances to ban single-use plastic bags now that Governor Pat Quinn Sunday vetoed the Plastic Bag and Film Recycling Act, SB 3442. 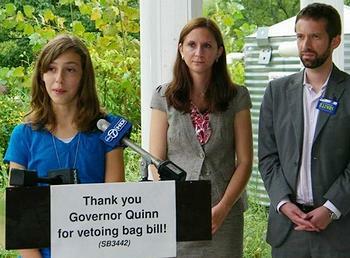 Illinois student Abby Goldberg, 13, joined by more than 173,000 people who signed her petition on Change.org, persuaded Governor Quinn to veto the bill. He did so on Sunday. Under the bill passed by the State Legislature municipalities would have been forbidden to enact bans or fees on plastic bags. Plastic bag manufacturers would have been required to establish recycling programs and increase the amount of plastic bags and films recycled in the state by 12 percent before the end of 2015. “While I agree with the intent of the legislation, I share concerns that this program would not increase the rate of recycling beyond the natural growth,” said Governor Quinn. The bill was opposed by the Illinois Municipal League and 150 municipalities that felt it would undermine home rule. “Local authorities and the environmental community strongly oppose this program because the metrics are simply not aggressive enough and home rule preemption prevents more stringent local regulation,” said Quinn. The Illinois legislature passed the bill in May over opposition from Illinois’ environmental and recycling groups as well as municipalities. 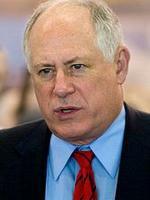 With his veto, Governor Quinn has prevented the bill from becoming law and returned it to the Illinois Senate, which reconvenes in late November. After her year-long campaign under the slogan, “Don’t Let Big Plastic Bully Me,” Goldberg held a celebratory press conference Sunday at her school, the Prairie Crossing Charter School in the Chicago suburb of Grayslake. Goldberg’s effort began in August 2011 when given an assignment to design a project for her environmental awareness class. She decided her project would be to motivate Grayslake to ban plastic bags. But when she found out about the state legislation that would prevent a ban, she began her online petition campaign. If enacted, the bill would have been the most restrictive limit in the nation on local governments’ rights to cut plastic bag waste.